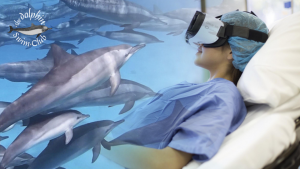 Over 150 hospitals and healthcare institutions worldwide provide the Dolphin Swim Club’s Wild Dolphin VR therapy. This Dutch / Swedish initiative proves to be successful for adults and children suffering from mental disabilities or autism. Starting this week, 10 Dutch hospitals will use so-called dolphin therapy. But the Dutch initiative is popular in the United States as well. In the Stanford medical centre, children undergoing heart surgery swim with dolphins before the procedure. And the wild dolphin VR has proved popular with patients suffering from chronic pain at the Cedars-Sinai Hospital in Los Angeles.